You are currently browsing the Carpe DMM blog archives for September, 2011. “Let That Be Your Last Battlefield” is famously one of the most anvilicious episodes of Star Trek ever made. It starts with the Enterprise en route to decontaminate a plague planet, when they intercept a shuttlecraft stolen from Starbase 4, just before its life support fails. The occupant is a strikingly pigmented alien, white down one side of his body and black on the other side, split right down the middle of his face. Spock declares it a “one of a kind” anomaly. The alien, Lokai, mends in sickbay when a mysterious ship approaches. Sulu helpfully announces there’s “a space vehicle ahead”, just so there’s no confusion that it might be a Spanish galleon or something. The vehicle mysteriously doesn’t appear on the viewscreen, despite sensor readings showing it there, then it suddenly vanishes amidst intercut shots of red alert lights dramatically zooming in and out, depositing on the bridge the alien Bele, who is pigmented asymmetrically like Lokai. Bele says he is a justice officer pursuing the criminal Lokai for the past 50,000 years across the Galaxy from their homeworld of Cheron. Bele and Lokai engage in a war of words. Lokai says he was persecuted and claims political asylum with the Federation, while Bele demands custody of him. Kirk keeps them apart and declares Lokai must first face trial for the theft of the shuttlecraft, but neglects to place any guards on the two aliens obviously bent on killing one another. Bele uses his psychic powers to take control of the Enterprise and head for Cheron. Kirk foils it with a threat to self-destruct the ship, forcing Bele to allow him to save the plague planet first. Bele then regains control, having deactivated the self-destruct mechanism first, and the ship flies to Cheron. 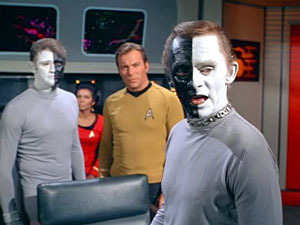 Bele and Lokai fight, and Bele calls Lokai and “his people” all sorts of thinly veiled racist epithets, and Kirk expresses his amazement that they could be so at odds, when clearly they are alike. Bele drops the hammer that no, he is black on the right side, while Lokai and “his kind” are black on the left side. Kirk sees the racial hatred for what it is now. They arrive at Cheron and discover the entire population annihilated by war and hatred. Kirk calls on Lokai and Bele to forget their enmity and live in the Federation in peace, but they escape and beam down separately, to continue their fight alone. Kirk delivers the obvious moral. It’s actually not a bad story, once you get over the sheer heavy-handedness of the anti-racist moralising. And the improbability of the colour scheme. And the unimportant padding provided by the plague world. Hmm. Well it is still interesting and engaging to watch, unlike some episodes. And although the moral couldn’t be more heavy-handed, the ending does leave the right sense of “what a terrible waste“. (The population of Cheron, that is, not the episode.) So yeah, actually not as bad as it could have been. Tropes: Anvilicious, The Plague, Amazing Technicolour Population, Red Alert, Really 700 Years Old, Self Destruct Mechanism, Two Keyed Lock, Cardboard Prison, Wham Line, Fantastic Racism, Hell Is War, An Aesop, Padding, Values Resonance, Silly Reason For War. Body Count: Entire population of Cheron (off-screen, before episode). “Whom Gods Destroy” begins with Kirk and Spock beaming down to the penal asylum colony of the coincidentally named planet Elba II. We learn that this is the last asylum in the Federation, since mental illness is apparently almost completely eradicated, with just a handful of difficult cases remaining. One of those cases is the former Starfleet combat veteran and hero Garth of Izar. Kirk and Spock meet Dr Cory, only to discover that it’s really Garth using a shapeshifting disguise, and the real Dr Cory is imprisoned in a cell! Garth captures Kirk and Spock and releases the other inmates, setting up his own personal empire within the colony. Garth’s insanity is underlined by his choice of clothing, with one blue shoe and one yellow shoe, and his unbelievably hammy acting. Another inmate is the green-skinned space babe Marta, whom Garth declares to be consort to him as emperor. Cory explains that Garth has somehow (inexplicably) learned to change his shape, and also that he claims to have developed an incredibly powerful explosive. If he escapes the colony, he will wreak havoc in the Galaxy. Garth’s attempt to get on to the Enterprise by posing as Kirk is foiled however when Scotty insists on the correct countersign to a chess problem password. This makes Garth angry and he goes on a hammy rampage of torturing Dr Cory and then Kirk in some sort of mental treatment chair, and showing off his madness more by donning a fur coat. Garth then goes into a decadent phase and has Marta dance for him and everyone else. Music appears from nowhere to accompany her dancing. Garth apparently isn’t pleased, because after another failed attempt to get on board the Enterprise he resorts to intimidating Kirk by pushing Marta out of the airlock on to the deadly planet surface. Then while she’s choking, he detonates an explosive in her necklace! Inevitably, things end up with Garth changing shape into a copy of Kirk, and then fighting the real Kirk in a fist fight. Spock appears and has to figure out which is the real Kirk. After some inconclusive dead ends, one Kirk tells Spock to shoot the other one, while the second Kirk tells Spock to shoot them both. Spock concludes the real Kirk would sacrifice himself to ensure Garth never escapes, so makes the right choice. Garth is finally subdued and begins his mental treatment again, showing now memory of earlier events. Not a bad episode. There’s suspense, drama, intrigue, and you’re genuinely left wondering how Kirk and Spock can get out of this mess. Garth is a truly over-the-top villain, but then he’s supposed to be insane, so it kind of fits. And just when you think Kirk will manage to save Marta, she meets a truly shocking end, underlining just how dangerous Garth is. Put it all together and it works pretty well. Tropes: Insane Admiral, Shape Shifting, Great Escape, Large Ham, Green-Skinned Space Babe, Newton, Einstein, Surak, Trust Password, Chess Motifs, Evil Is Hammy, Agony Beam, Invisible Backup Band, Thrown Out The Airlock, There Is No Kill Like Overkill, Ham To Ham Combat, Good Old Fisticuffs, Spot The Imposter, Kill Us Both. Body count: Marta (blown up while choking to death!). Wednesday, 20 April, 2011. 17:57. Hotel Leon de Oro, Lima, Peru. 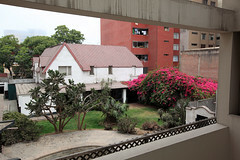 We have arrived in Peru for a couple of days in Lima before joining our next Intrepid tour. We were up and packed by 05:30, and then at Guayaquil Airport by about 06:00. The first thing we encountered was a gadget staffed by two men which they were using to encase people’s luggage in great reams of plastic wrap. A lady tried to push us towards it, and at first we thought it was some sort of security requirement. But the guy said it cost US$10 a bag, and it seemed to be optional, so we started to walk away towards the check-in desks. The woman urged us in Spanish again, this time miming rainfall, and we realised that the plastic was meant to protect bags from the rain that was pouring down outside. Given the chance that our bags might be exposed to that while in the care of the airline, we paid our $20 and had the bags encased in plastic. It was a good thing too, because when we collected them, the handles (the only exposed bit) were soaked, and I saw some obviously water-damaged bags on the baggage claim carousel in Lima. The flight was only 1.5 hours, and we had our breakfast on board – just a sandwich – but we also had some chocolate that M. bought last night while we were waiting for our hotel pick-up. On landing in Lima, we passed through immigration and customs quickly and were met outside by a helpful woman from Intrepid, who led us to a four-wheel drive driven by a woman called Alice to take us to the Hotel Leon de Oro. The Intrepid woman (we didn’t catch her name) warned us to only carry enough cash for what we needed when walking around Lima. I watched “Elaan of Troyius” several weeks ago, but haven’t had time to write this up until now. 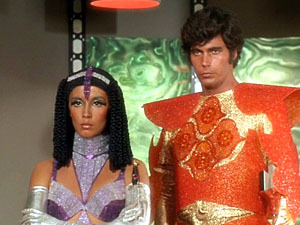 It’s a very awkward episode to watch, both for the cringe-worthy 1960s gender relations and the psychedelic orange plastic space clothes. The Enterprise has been ordered to carry out a diplomatic taxi mission, taking the feisty Elaan, Dohlmen (i.e. Queen) of the planet Elas, to the planet Troyius in the same system, where she is to marry the ruler in an arranged marriage. Elaan is not happy about any of this, is arrogant and bossy, and followed by absolutely loyal guards who boss around the Enterprise crew on her every whim. What’s more, they are armed with what Kirk describes as “armour and nuclear weapons” (while Elaan is clad in a stripperific royal outfit). Kirk bristles at Elaan’s arrogance, but holds his tongue. The Troyian ambassador Petri is also restrained, but cannot hide his inner dislike of Elaan and her barbaric ways. This ends with Elaan’s dagger in Petri’s back. Despite this, Kirk doesn’t call off the mission or arrest Elaan. Petri recovers in sickbay. Nurse Chapel wonders why Elasian men put up with Elasian women, and Petri reveals in a blatant piece of foreshadowing that the women secrete a substance in their tears that acts like a love potion. Meanwhile, the bridge notices a weird “sensor ghost” that turns out to be a cloaked Klingon vessel trailing the ship. Elasian guard Kryton sneaks into engineering and tries to destroy the warp drive. Redshirt engineer Watson finds him and suffers a broken neck for his trouble. It turns out Kryton is conspiring with the Klingons somehow, but he kills himself when captured rather than reveal what he’s up to. Kirk orders Scotty to “check every relay” in the engine room for sabotage. I guess warp engine circuits don’t use transistors or integrated circuit chips. Relays are probably safer with all those weird particle fluxes around. Kirk confronts Elaan with the aim of forcing her to behave herself. She confesses that she thinks other people don’t like her and starts crying… yes, you’ve spotted it already. Kirk gets affected by the love potion tears. Elaan decides she likes Kirk and would rather marry him than the ruler of Troyius. She changes from hard-edged savage queen clothes to much softer damsel-in-distress clothes – symbolic, saccharine, and tacky at the same time! They kiss… and Spock and McCoy burst in to say that Scotty has found a bomb is wired to the warp engine, and the Klingon ship is attacking! Kirk manfully pulls himself away from his desire and back to his duty. Overall, with the interwoven plotlines and the Klingon intrigue, it’s not a bad story. It’s just painful to watch because of the truly annoying Elaan and her sudden about turn into a meek submissive when she meets the True Man, Kirk. If they’d toned that whole thing down a lot and concentrated on the Klingon mystery it probably would have been a better episode. Tropes: Space Clothes, Nubile Savage, Call A Rabbit A Smeerp, Royal Brat, Stripperific, Love Potion, Red Shirt, Better To Die Than Be Killed, Technology Marches On, Pygmalion Plot, Moment Killer, Worthless Yellow Rocks, No Blood For Phlebotinum. Body count: Watson (neck snapped by the Elasian Kryton), Kryton (suicidal self-disintegration).